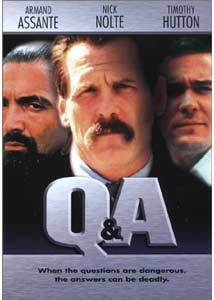 "From now on, for all intents and purposes, the Q & A defines what happened. If it isn't in the Q & A, it didn't happen." Q: So, what movie did you watch tonight? A: Ugh. Don't get me started. It was this utterly forgettable thing about corrupt cops, directed by Sidney Lumet. Q & A, it was called. A: Yeah, see, Timothy Hutton (still whiney, and Ordinary People came out ten years before this movie was made) plays a wet-behind-the-ears assistant DA investigating the death of a street punk. The guy was murdered by Nick Nolte, who plays a perverted psycho cop, except Hutton doesn't know that, and he has been chosen by this guy, Quinn (played by the guy who played Arthur in those made-for-TV Perry Mason movies), to wrap up the case, because Nolte is on Quinn's payroll. Q: Don't give away the whole movie! And hey, I thought you were explaining the title. A: I'm not giving anything away; all this stuff was obvious within the first 15 minutes. That's why the movie was so boring. And it's called Q & A because when a DA investigates a case, he grills the involved parties in what's called a "Q & A" session, creating an official record for the courts. They mention the title about a million times throughout the movie. A: No, it was really annoying and self-conscious. The rest of the storyline wasn't too hot either. It eventually dawns on Hutton that Nolte is a bad guy, and he tries to gather evidence, which involves hunting down witnesses, like a drug dealer played by Armand Assante, who rats on Nolte to get him off the streets and because he killed one of Assante's guys. Oh, and this drag queen prostitute who, I think, designed clothes for Assante or something. Hutton's not the best investigator, so most of his witnesses wind up dead before the case even goes to trial. And we're supposed to be all devastated to learn that there is corruption in the NYPD, and that even some politicians are corrupt. Ooo, shocking! Q: So... you didn't like it? A: And even if we ignore the nearly lifeless, rote plot, there's the matter of a little thing called dialogue. Namely, that all of the dialogue in this movie is terrible. Everyone talks like characters in a poorly written comic book. Q: Oh, come on now. Aren't you exaggerating a little bit? Give me an example. A: Ok, how about when Timothy Hutton tells his ex-girlfriend (Jenny Lumet) that he's "been dying a little bit every day" since she left? Q: That doesn't sound so bad. A: Dude, that line was in Attack of the Clones. A: And speaking of tacked-on love stories, I can't fathom why that stupid sub-plot was necessary anyway. First of all, the odds that Hutton's old girlfriend would wind up dating the very swarthy drug dealer vital to his case? Very slim. And there was already plenty of superficial racial commentary, why was there that whole bit about how Hutton freaked out when he found out her father was black? I tell you why: Sidney Lumet wanted to give his daughter a part in the movie. Although it was a relief to learn that there wasn't actually a casting agent brainless enough to give her the role, since she shrieked all of her lines. Did we learn nothing from The Godfather III? Q: Both films came out in the same year! A: That's no excuse. It's not like Jenny Lumet was the only questionable casting choice. I think they just pulled out "The Big Book of Ethnic Clich�s." Yeah, ok, Armand Assante was pretty good as the drug dealer, Bobby Texador. Q: Can you believe someone got nominated for a Golden Globe for playing a guy named "Texador"? A: I know. But otherwise. Like, all of the Puerto Rican characters are either drug dealers or transsexuals. And the gay characters are all really slutty and trashy and lispy. Nick Nolte is particularly manic. I guess if you're playing a poorly written corrupt cop who has a thing for strangling cross-dressers, you might as well go way over the top and spray spittle everywhere. Q: Wow, lots of gay characters. And you mentioned racial commentary. That sounds pretty progressive! Would this be a good movie to increase awareness about police mistreatment of minorities? A: Only if we really needed another film that reaffirmed every stereotype in the book, and dealt with race relations in a most ham-handed, offensive manner. Let's go down the list. Every gay character does drugs and winds up dead. All the Latinos are drug dealers and wind up dead. The Irish cops are all violent and corrupt. The only Italians in the movie are in the Mafia. Even the minority cops on the force, played by Luis Guzm�n and Charles Dutton, are textbook, their witty banter consisting of a slew of racial slurs labeled acceptable because, hey, both of them are minorities! Q: Did Dutton's character really say that, on the inside and outside, he wasn't black, but blue, like a cop's uniform is blue? A: Yes. Yes he did. Q: And you actually watched this entire movie? A: Hey, how was I supposed to know? The cast is, you've gotta admit, pretty impressive, and Lumet has made some good movies in the past. Just not lately. Q: Whatever. Didn't you see Family Business? That movie rules! Image Transfer Review: This is a decent transfer for a catalogue title. Colors are solid, and the picture shows good detail, despite some occasional graininess. Black level is only fair, with darker scenes looking a tad washed out, and there's some occasional shimmer and artifacting, but nothing too horrible. Audio Transfer Review: The included 2.0 DD track is about as basic as they come, even for a dialogue driven film. Speech is always nice and clear, but has a tendency to sound a bit hollow. There are some sound effects here and there�rain, an explosion�but they don't really make use of directionality or panning or anything like that. The score sounds nice in the mains, but when piped into the surrounds, it's a little thin. LFE is nonexistent, but that's not really an issue here. Q: Does this disc include any cool extras? Q: Does this disc include any extras? A: Do you consider subtitles an extra? Q: No. And hey, who's supposed to be asking the Q's here? Q: So, A, what did you think of Q & A? A: It wasn't very good. Sort of entertaining, but mostly a poorly written movie about some very dumb corrupt cops. The hammy dialogue especially felt like pointless stylistic excess. Q: Kind of like this review? A: I thought I told you to shut up.